As part of Lane "I'm not a political operative" Bajardi's extensive behind the scenes Hoboken political activities on behalf of Beth Mason and the Russo faction, there's this little gem from the 2011 ward races. What's good for Beth Mason is good. If that means aiding and abetting the Russo clan, so be it. Related in the Bench Slapped series, is an excerpt from this January 2014 deposition in the Bajardi v Pincus civil litigation. Hudson County decades long political operative Tommy Bertoli offered comment on the 2011 Hoboken ward races and the Mason family expenditures on behalf of the Russo clan. Talking Ed Note: Isn't it reassuring to know that Lane Bajardi and his "not a political operative" wife, Kimberly Cardinal Bajardi "really care" about the Russo clan? Here too is the smoking gun how James "FinBoy" Barracato has all but become the Hoboken second ward council representative. 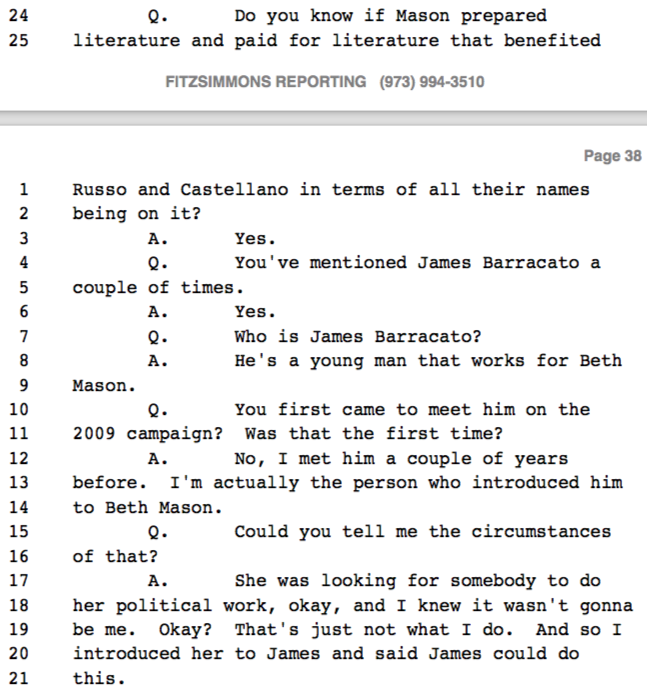 Beth Mason only "occupies" the seat physically as this MSV story breaking EmailGate so amply reveals. MSV broke this July 2013 story exclusively and no other media reported on the odd connection of a first ward councilwoman putting the name of Beth Mason's political operative on an email in a request for City of Hoboken legal information. The word cover-up comes to mind but the common ommission of truth is all too common in these parts among elected officials and what MSV coined the Mason Media Complex which serves them. “Limited public figures are those who have thrust themselves into the vortex of a public issue or have engaged the public’s attention in an attempt to influence its outcome. When it considered the public controversy prong, the Court must consider whether the alleged defamation involves a public controversy and the nature and extent the plaintiff’s involvement in that controversy.” Berkery v. Kinney, 397 N.J. Super.22222. “A public controversy is defined as a real dispute, the outcome of which affects the general public or some segment of it and the content, form and context as revealed by the whole record must be considered. Once a person becomes a public figure in connection with a particular controversy, that person remains a public figure thereafter for purposes of later commentary or treatment of that controversy.” The contentious factionalism present in Hoboken politics constitutes a sufficiently particular controversy to which an individual may have a connection, making that individual a limited purpose9public figure per Berkery. 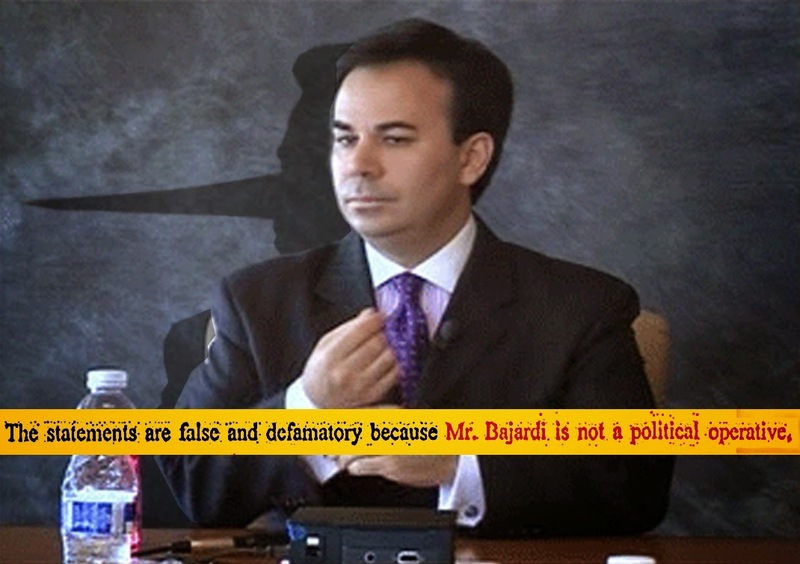 The Court finds that Bajardi has been heavily involved in the factional discord; that he has made efforts to inject his talents into the furtherance of one side over the other; has presented himself at various public gatherings in connection with one of the factions; has actively and publicly advocated for this faction; has communicated with public officials on matters involving Hoboken politics and can generally be considered involved in that particular controversy. As a result, even though plaintiff claims to have withdrawn from civic involvement as of a certain date, he remains a public figure thereafter for purposes of later commentary or treatment of that controversy. Furthermore, aside from plaintiff’s status as a limited public figure, the issue of Hoboken political factionalism is one of public concern and is, therefore, offered the highest possible constitutional protection. W.J.A. v. D.A., 210 N.J. 229 (2012). G.D.4v. Kenny, 205 N.J. 275 (2011) and Rocci v. Ecole5Secondaire MacDonald-Cartier, 165 N.J. at 149 (2000).